Accessioned by the University Archives in March 1979. The collection is organized in seven series: Clippings; Correspondence; Costume Notes; Memorabilia; Minutes; Music Books; Photographs. All the series are arranged alphabetically by subject with no distinction as to date. 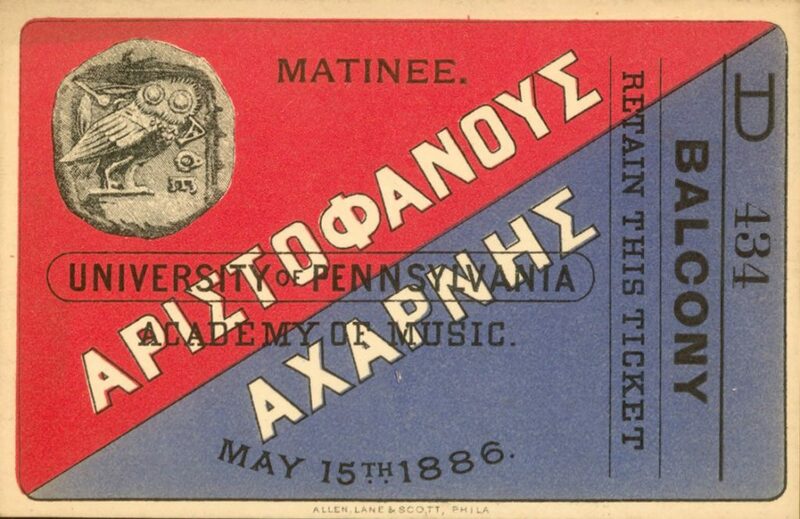 On May 14 and 15, 1886, a group of seventy Penn students put on Aristophanes’ Acharnians, a Greek play set in 425 B.C. satirizing the Peloponnesian War. An audience of nearly three thousand turned out for the performance, which took place at the Philadelphia Academy of Music. 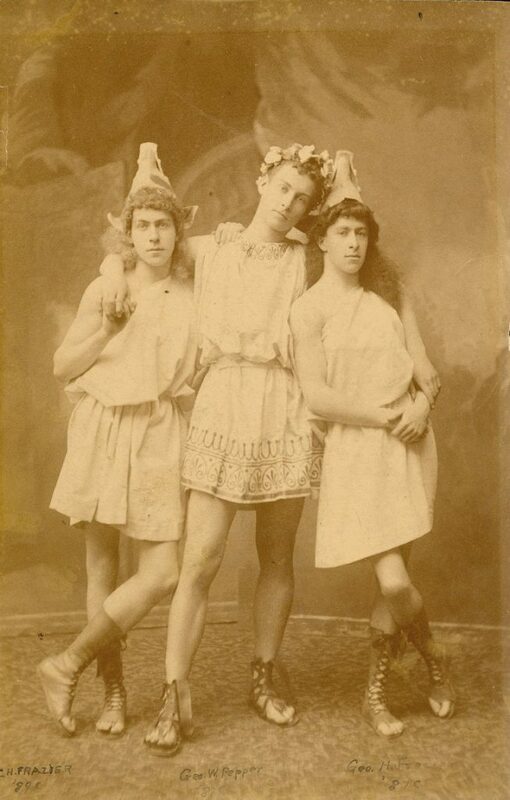 The presentation marked the first time a Greek comedy was presented in America, the Greek play produced by Harvard in 1881 being a tragedy. Subsequent performances took place at the New York Academy of Music in November 1886. The Acharnians was presented in the original ancient Greek. An elaborate illustrated libretto with the Greek text and the English translation in parallel columns could be purchased to render the play intelligible to the large portion of the audience unfamiliar with the Greek language. It was produced by Morton W. Easton, Professor of Philology and presented with an accompaniment of modern music composed by Dr. Hugh Archibald Clarke, Professor of Music. George Wharton Pepper played the leading role of Dikaiopous. During rehearsals, Eadweard Muybridge, the pioneer photographer of motion, took photographs of three scenes, which were later published in Harper’s Magazine. 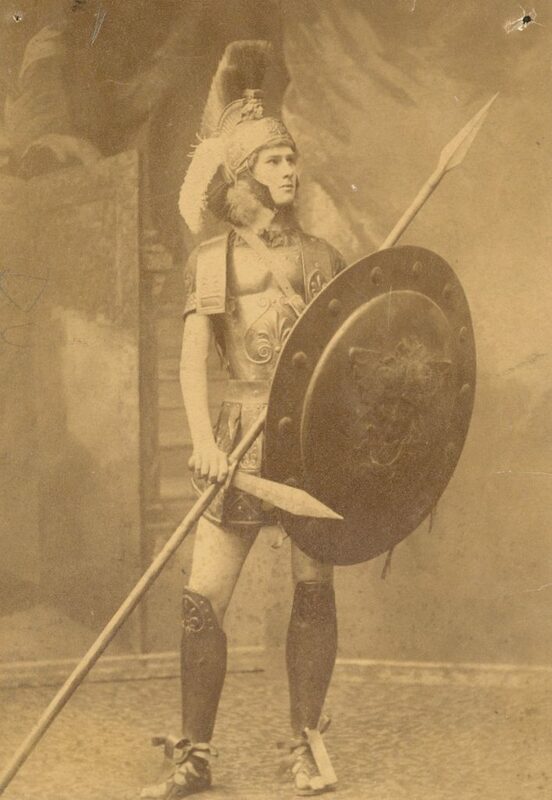 This collection provides valuable insight into the 1886 Penn production of The Acharnians. Apart from numerous articles that describe and critique the performances, it largely consists of notes documenting the preparations for the play. These include a swatch book with detailed descriptions of each costume, various sketches and watercolor drawings, and a costume account book. The minute book of the special committee appointed to overlook the play’s production documents other behind the scenes work and lists the names of those involved. Also surviving as part of the collection are several personal letters of William Klapp and Morton W. Easton. The latter is a handwritten response to Davidson, a Harvard professor and newspaper critic who negatively reviewed the play. The remainder of the collection consists of memorabilia, including tickets to the Philadelphia performance of the play, librettos, programs, and copies of the Philadelphia and New York Prospecti. There are also two published books of music complete with lyrics and scores composed by Hugh A. Clarke as well as numerous photographs of the actors in costume, including those taken by Eadweard Muybridge.